I've just tested it on my Atari STE and it works fine. I loaded it up and recorded a couple of tracks with no issues. The CREATOR.PRG file itself is not cracked and the program will freeze on the main screen. However, the uncracked file will actually run with ANY C-Lab dongle, including a Notator one! I tested it with Creator 2.2, Creator 3 and Notator 3 dongle and they all work. It's a bit odd because normally Notator and Creator dongles are not interchangeable. Running the program with a dongle instead of the crack actually gives you an extra bit of free memory (note that my Atari has 4MB so on a 1MB machine the difference would have been sizeable). See Pictures. On the subject of dongles and versions: a Creator 3 dongle will run ANY previous version of Creator from the very first and a Notator 3 dongle will run ANY Notator version from the earliest one. pretty old cracked copy . 1988! thats goin back! Unfortunately it won't run with only 512KB of RAM. I tried it in Steem, setting it as a 520STF and Creator crashes with a "Memory Panic" error. I don't have a 520ST to try it in "real life". Since the crack uses quite a bit of memory, it MAY be possible to run on a 520ST in "uncracked" mode (see above post) with a C-Lab dongle of any later version. 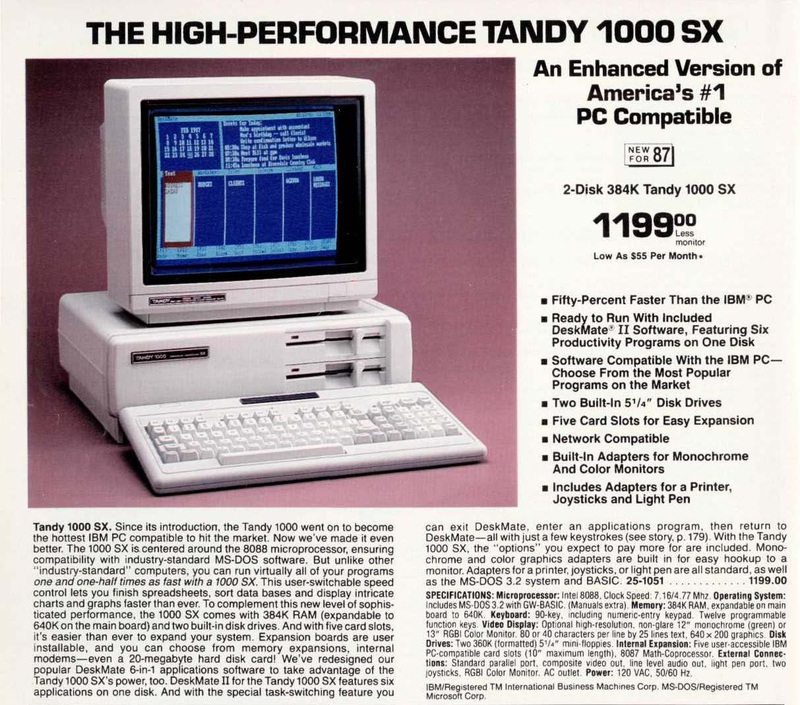 my dad worked for radio shack so he got the computers at cost from radio shack.. the tandy computer line..
im actually trying to find a tandy system now for nostalgia purposes...but id be happy to just find any RGB EGA CRT type color disply from 88, 89, 90 time zone.. its a great time for computing memorie for me, i eventually was running a BBS from my bedroom with 2 phone lines active... most of this all done within DOS i think.. not even running on windows 3.1 - software was called "RemoteAccess" / "Spitfire BBS" / eventually one came out called ROBOboard i think that featured VGA graphics instead of EGA ANSI type graphics.. remoteAccess was the overall most popular at the time. Those Radio Shack PCs look really cool with the 5 1/4 drives! in UK we had cheap Amstrad PCs but monitors had non-standard connectors because the PSU of the whole system was.....inside the monitor! So the cannot be used nowadays with a TFT. Here are the extracted files from the above disk image. The floppy must be a DD disk NOT a 1.44 HD one. Copy the files in the ZIP to the floppy. These files will work fine on an UltraSatan SD hard drive. so wait - are you saying the cracked program wont run without a dongle of some sort attached? but it doesnt have to be a notator dongle? Sorry, what I wrote was a bit confusing. There are two ways of running this version. - To trigger the crack and use it WITHOUT dongle you must run it from the "1_LOADER.PRG" file which activates the crack. Apparently the crack works as a dongle emulator in memory. - If you do have a dongle for ANY version of Creator / Notator then you can run "CREATOR.PRG" instead, which will trigger the UNCRACKED version which may be more stable. ok that makes alot more sense - thank u for clarifying! You are quite right to say that they are rare over there! I just checked ebay.ca and ebay.com and there aren's ANY Atari STEs for sale at all! Only a couple of old wrecked 520 STs. However, the last one that popped up in the US went for a real bargain!!! 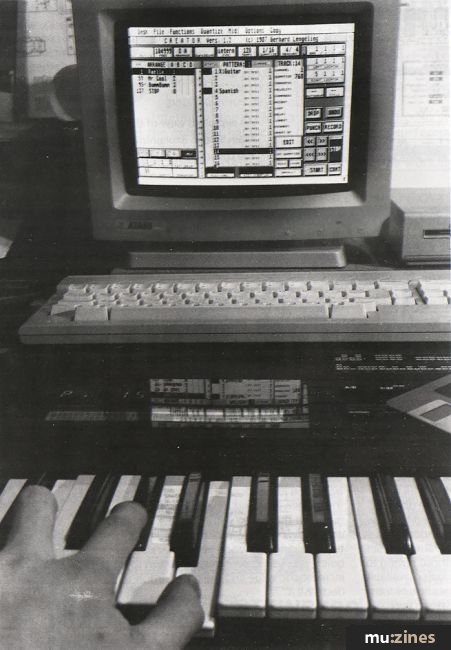 Just the original Cubase 3 for Atari included in this sale would fetch close to £300 here in UK! Ant the ST itself is one of the "pimped" ones for music production. It's so immaculately white! That would be worth close to £200. Plus the Midex + expander (£80ca). If you do find one, don't bother with the monitor if it save money on shipping. You can get a cable that connects it to any VGA screen for about £20.